Retroblog: iMini 1.1 update. First Tabletop ready app on the Audiobus! iMini 1.1 update. First Tabletop ready app on the Audiobus! We're happy to announce the release of iMini 1.1. 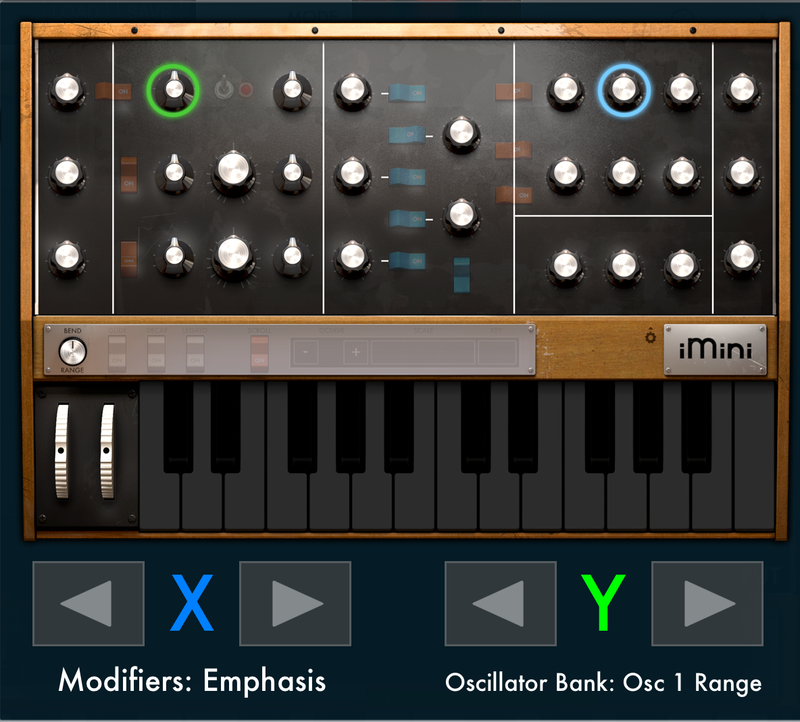 A iPad recreation of the Minimoog, one of the most iconic synthesizers of all time! iMini is Tabletop-Ready app and Audiobus compatible. Use iMini with daws like Garageband or seamlessly on Tabletop. iMini is on sale in the AppStore now. Here is an overview of iMini's powerful features. This screen contains the bulk of the controls, providing access to the oscillators, filter envelope, mixer, polyphony option, and loudness contour. iMini comes with hundreds of built-in presets, which you can open by tapping the Load button. Tap Save to change any edits you make a preset or create your own! 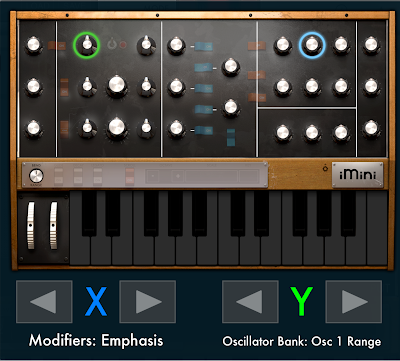 Tap the gear icon next to the iMini plate to open this panel, where you can edit the range of the pitch bend, change the scale selection on the keyboard, shift octaves, and turn on the decay, glide, and legato. The scroll button allows you to move the keyboard to change octaves (good for a glissando), while the zoom button allows you to use a pinch gesture to change the size of the keys. This part of the app lets you set the tempo, connect to other iOS devices via WIST, set up a MIDI controller, and launch in Tabletop (more on the Tabletop-Ready version of iMini at the end of the post). In the perform view you can turn on the arpeggiator and set its parameters, as well as set the controls for the XY pads. Tap the gear icon above a pad (the one that looks like a donut at this resolution) to set the axes of the pads. Just use the arrow buttons to map an axis to one of the controls from the perform screen. This feature is great for creating evolving sounds in real-time. The effects screen is where you can enable the chorus and delay and adjust their parameters. Don't forget about the Output knobs on the right that change the amount of these effects! Hurry on over to the App Store to get this fantastic new release!